You heard about bike camping right (touring, but whatever)? 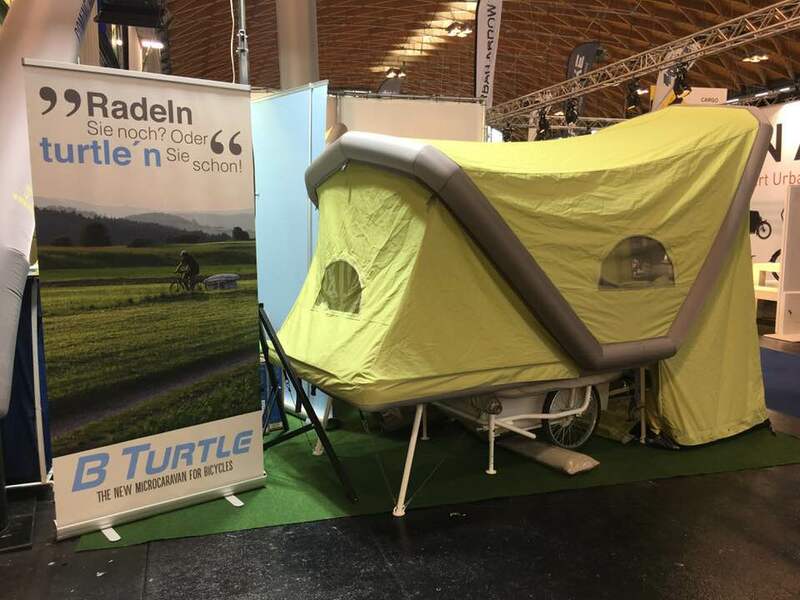 Well, here’s bike glamping with B-Turtle as seen at Eurobike and from the Gentle Tent. I didn’t make the annual bike industry trade show in Europe, but I did spot this luxurious micro-caravan for e-bikes in my friend’s posts. Integrated transport tray inside the bike trailer with a load capacity of about 120 liters (Length: 104cm, Width: 45cm, Height: 26cm). A waterproof PVC bag is protecting its content and can be completely closed via a zipper. Two aluminum support struts provide greater stability for the deck platform. The actual air tent above the deck platform provides a pleasant interior height of about 130cm in the entire tent. Ventilation and light is ensured by a window on the rear wall and two windows with mosquito nets on both sides. A connected awning serves as an entrance area and provides plenty of headroom and a fully rollable doorway. The storage space inside the bike trailer is easily accessible from the awning. (Length: 110cm, Width: 130cm, Height: 200cm). To enable a weight load of up to 200kg in camping mode, the wheel axle is enclosed on both sides by the B-Turtle’s frame. Unlike conventional quick-release axles, The B-Turtle retails for €2.990. The B-Turtle isn’t the first bike camper we’ve seen from Eurobike or last. There’s also this camper and the Kevin Cyr concept seen in 2009.